A number of strategists continue to call for significant price increases in gold. Apparently investors have been ignoring those calls. In particular hedge funds have been exiting positions in precious metals recently, driving prices lower. 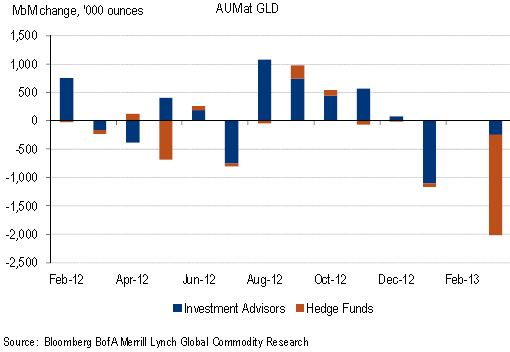 The chart below shows changes in holdings of GLD (gold ETF) by the two major investment groups. Hedge funds have been responding to the recent strength in the US dollar as well as a number of technical signals. With some of the fast money out of the market however, there is a potential for firmer gold prices. In spite of the recent talk of the Fed exiting the aggressive monetary expansion policy, so far all signs point to more asset purchases by the central bank - at least in the near future. Historically gold price roughly followed the US monetary base (or bank reserves), particularly since the Lehman collapse in 2008. Recently the two trends have diverged. But as bank reserves continue to increase at a steady clip in response to Fed's purchases, this divergence is unlikely to grow further. Moreover, Merrill Lynch analysts point out that over time investors will play a diminished role in determining the price of gold. ML: - The reduced importance of investors in the medium-term is heavily influenced by more affluent emerging markets, which should translate into steady increases of spending on non-essential items like jewelry in the coming years. Their model suggests that in the next few years, even if demand from investors declines, gold price could reach new highs. 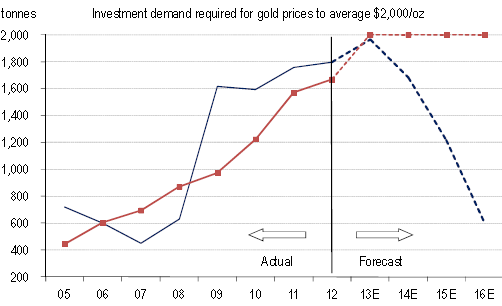 In fact by 2016, investor demand would only need to be at the level of 2008 to keep the price at $2,000/oz. ML: - Our data shows that to sustain gold prices at $2,000/oz by 2016, investors need to purchase a similar amount of gold than in 2008, when prices hovered around $872/oz. According to these models, in the coming years even a moderate investor participation will drive gold prices higher. And it won't take much to entice investors to keep buying at least at the same pace they were five years ago.